Sometimes it’s the small things that make a huge difference in the comfort of your home. This recent full bath remodel had no wall to the exterior and therefore was a dark space. 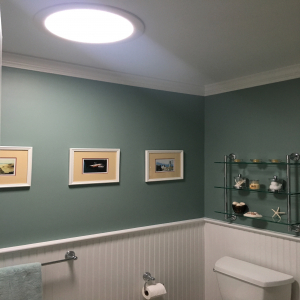 We installed this Velux 14″ sun tunnel in the ceiling to bring lots of natural light into this otherwise dark bathroom.